The highly personal nature of social media has brought the issue of privacy to the forefront, but now Facebook is showing users just how much it knows about them. NYDailyNews.com reported on how the social network is enabling users to download some of the personal data the company has collected from 2010. The original version of Facebook’s “Download Your Information” feature included copies of photos, messages, status updates, and videos that users had shared. It also included lists of friends, content posted on users’ walls, and records of chat conversations. Now, Facebook has updated this feature to provide users concerned about social media privacy with more of the information the company has collected, such as prior usernames, mobile phone numbers associated with accounts, unfulfilled friend requests, the names of people they’ve listed as previous relationships, and more. The move is considered a step in the right direction as Facebook strives to provide users with greater control over their personal data and social media privacy. The feature is quickly gaining a following among users, with 40,000 of them already requesting access. In response to critics who say the company isn’t providing enough information, Facebook recently explained that the feature is being rolled out gradually to all users and that more information will be available for download in the near future. 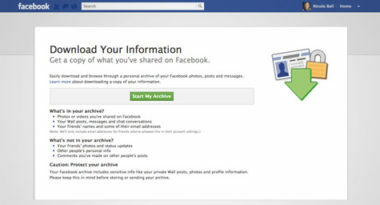 The “Download Your Information” feature can be accessed by clicking the drop down arrow to the right of the ‘Home’ button, then clicking on ‘Account Settings.’ A link should appear at the bottom of the screen that says ‘Download a copy of your Facebook data.’ Then, users can simply click the words ‘Download a copy,’ then click the button on the screen that reads ‘Start My Archive.’ Users will receive an email once their personal information has been compiled into a downloadable file. To discover the latest ways to use social media marketing to enhance your marketing ROI, contact MDG Advertising today at 561-338-7797, or visit mdgadvertising.com. Read more at the nydailynews.